In a large pot or wok, heat 1 tablespoon oil over medium heat. Add shallot and ginger and cook 3-4 minutes or until just tender and fragrant. Put the stock, 2 tablespoons soy sauce, 1 cup kim chee, and bok choy into the pot, and bring to a boil. Reduce heat and allow the broth to simmer for 10 minutes or until bok choy is just wilted. Add mushrooms and tofu and additional soy sauce and kim chee to taste, if desired, and simmer an additional 5-10 minutes or until mushroom are tender. Stir in chopped cilantro, if using. Meanwhile, while soup is simmering, bring a pot of salted water to a boil and cook soba noodles according to package instructions. In another large sauté pan, heat remaining tablespoon sesame oil to high heat. Quickly cook chicken in hot oil until just cooked. 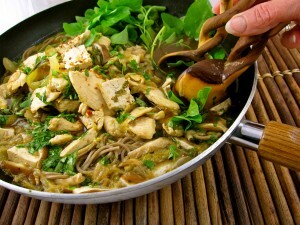 Add the noodles, chicken and watercress to the soup before serving; or divide the noodles and chicken between six bowls, pour steaming soup over noodle-chicken mixture and serve, garnishing each bowl with watercress. *Select hot or mild kimchee, according to your palate. I usually select mild kimchee and let individuals add chili paste or red pepper flakes according to individual taste.